Two years ago confidence dropped as some people started realizing that maybe, just maybe police forces should be held to some sort of accountability. But not anymore. After Trump’s victory and the confirmation of former Alabama Senator Jeff Sessions as Attorney General in the new administration has restored the confidence in the police among certain types. You know the types. Gallup gives a snapshot of who they are. Confidence among Republicans and Republican leaners, whites, conservatives and those aged 55 or older has been stable or has increased slightly. That’s not the case among young people, particularly those who are people of color as this table published by Gallup shows. Confidence among conservatives has increased since 2015. Basically when confidence was dropping nationally because the reports of abuse were being documented in film, conservatives decided that shooting unarmed black people is what police should be doing. 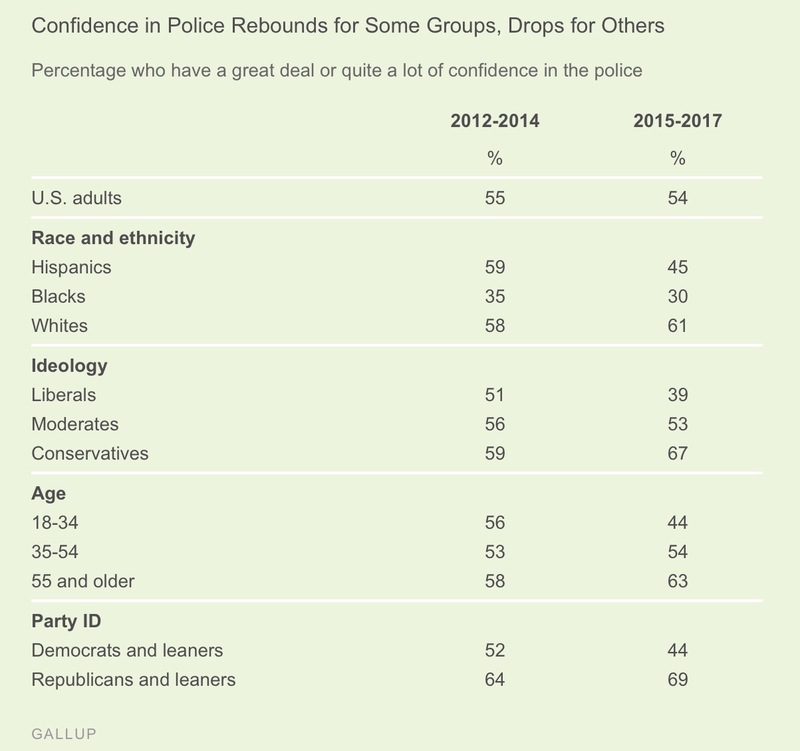 Gallup further reports that in the June 2017 survey they base most of their analysis on, conservative confidence in the police is 73 percent, the highest it has been since 2000. Not surprisingly, an era where mass incarceration and abuse was reaching its apex and the type of policies that AG Sessions wants to return to. Since the only institutions conservatives have more confidence on are the military and businesses, we can be pretty confident that they are pretty cool with fascism as well.